Selecting the proper planting materials is an essential step in making the proper preparations for your soil. Chances are your soil is not perfect, so you will need to determine what your soil lacks in order to know what to add to it. Furthermore, plants differ in their soil preferences so if you have your heart set on a plant already picked out for a certain location, it would be in your best interest to figure out what type of soil the plant likes and build up your native soil accordingly. Make sure to check the physical condition of the plant. Discolored leaves and fuzziness are tell tale signs that the plant deserves to be passed over. If the plant you are eyeing has any signs of decay such as insects, disease, brown spots, mushiness, bite marks, webbing (spider mites), try to look for a healthier one. Some stores offer a warranty/return policy on specific plants and trees for up to one full year, but others may not be so lenient. The plant you choose should look healthy and have established roots so later on the roots will develop in your garden not overlapping each other or outgrowing its original pot. 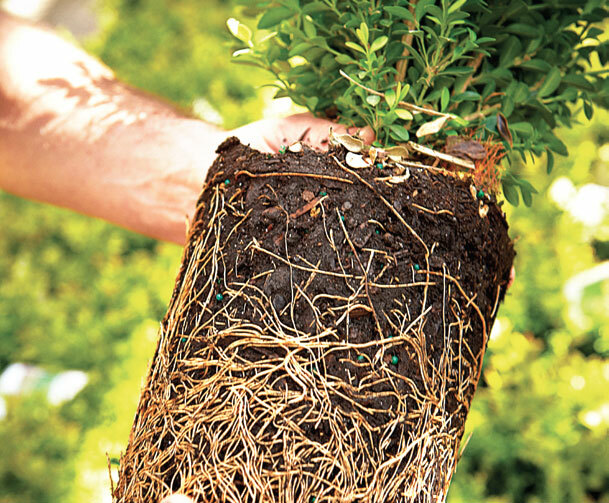 It can be difficult to fix a plant that has rounded roots due to a small container but it is not impossible. It is better to avoid this altogether if necessary. Overlapping roots can cause major problems later such as the slow death of your plant, wilting and growth problems. Make sure you can loosen the roots so that they can grow into the ground rather than in a pot. get one that’s about to bloom, so you can enjoy it in your landscape/garden. Perennials have a shorter bloom time than annuals. Don’t be tricked into buying a plant that was forced to bloom. If the plant tag says it blooms in August, don’t buy the one blooming in June, exercising patience at this point means your plant can have stronger roots and blooms in your garden/landscape. After choosing the right plant to take home, be careful when removing it from the pot. Squeeze the sides to loosen soil and gently tug at the base to separate the plant from the pot. For more information on how to choose quality planting materials at Woodlawn Landscaping & Garden Center, call (610) 647-1300 and ask to speak with a garden center associate.